Artur Lääts was one of the DJs at the launch party of Mürk (Poison), a series of techno nights in Tallinn. That moment, he and Mürk’s promotor Hugo Murutar hardly thought, maybe only dreamed, about conceiving a self-titled record label. But after running a kickstarter campaign, Mürk Records became reality and the inaugural MRKR001 was officially released in September. Lääts can’t be regarded as a freshman, because already in 2010 he debuted on Contrast-R (Belgium), followed by a cyclonic digi EP on the Australian label Gynoid Audio. For the vinyl debut, Lääts has dropped his earlier Glitchfxx moniker, which might indicate “Apollo EP” is about a new phase for the artist. Vast amounts of techno releases that hit the shelves every week might raise a question, what is special about this particular one? 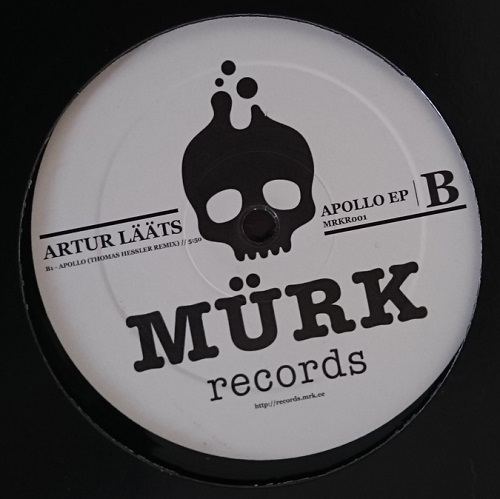 Firstly, seeing a fellow Estonian going wax is important for the local scene and secondly, two original tracks are mature enough to suggest them both to the fans and to people who have shunned techno so far. Moderately paced title track offers bold techno grooves that are arising from Detroit’s depths, recalling Beltram’s bass arrangements and Hood’s synth blasts. Of darker breed is “Stratskas”, which runs on a thundering vocal effect (‘I just want to dance with you’ and so on) and carries some Chicago house influences. Only an oversize break at the mid-track would leave the crowd puzzled for a moment. Berlin producer and DJ Thomas Hessler dwells on the B-side with a fluent rework of the title cut, which is a safe bet for DJ sets. With the start done, we may just hope that both the juvenile label and Lääts keep exploring and new material will be in the pipeline soon. This review was initially published in the Estonian monthly Müürileht.